An evaluation of the wet deposition measurements, carried out on a regional scale in the FRG during the period 1979–1981 is presented for pH, sulfate and nitrate. pH values are observed in the range of pH 4.0–4.5. The temporal variation of the sulfate and nitrate concentration in rain seems to be similar at all stations showing maximum values during spring. 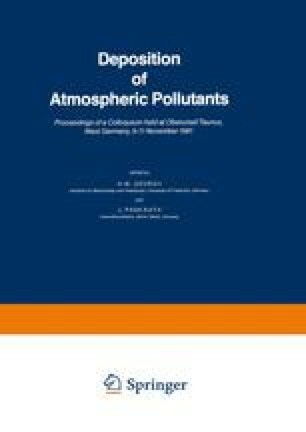 The regional sulfate and nitrate concentration patterns in rain differ between polluted and less polluted areas by a factor 2–3. The regional distribution of the wet sulfate and nitrate deposition is mainly determined by the precipitation pattern. The relative importance of sulfate, nitrate and chloride for the acidity in rain is discussed.